Playing bridge game can be fun, but one needs to keep the tab on the score. With the bridge score sheet, one can now easily keep the tab on game and play without any difficulty. 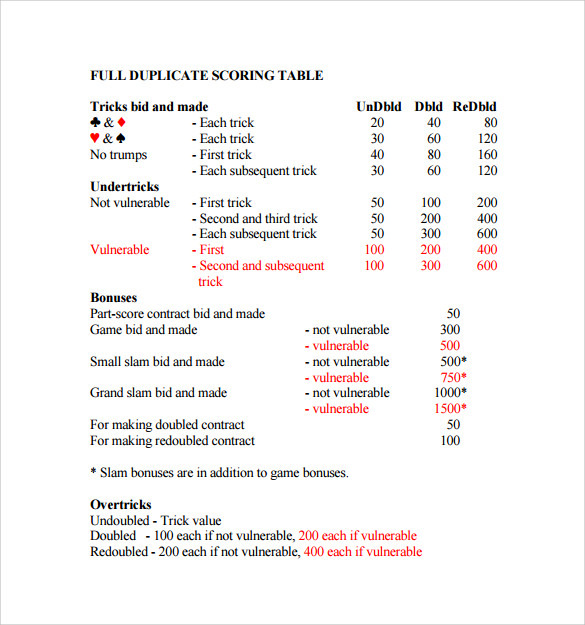 The Bunco Score Sheet is divided into two parts having same details- Bridge Score Pad having divided into Trick Values, Duplicate and Over tricks. Below one can see We and They. 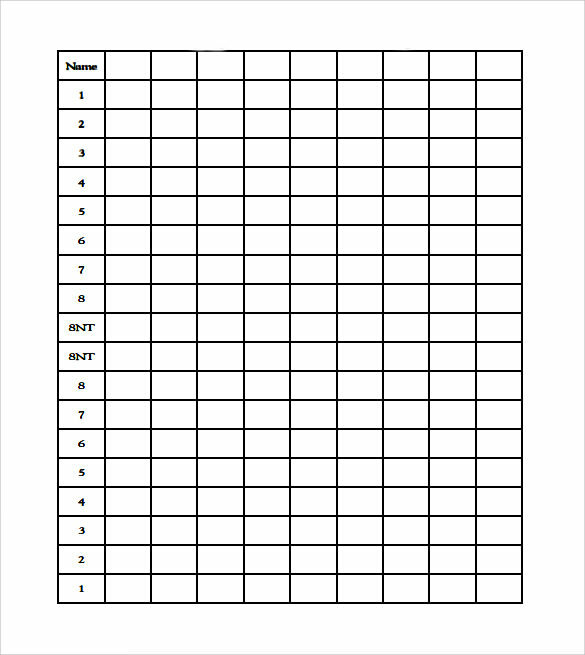 The player or supervisor need to fill the sheet as the game progresses. One need to first understand the game and sheet that will help in filling the same. 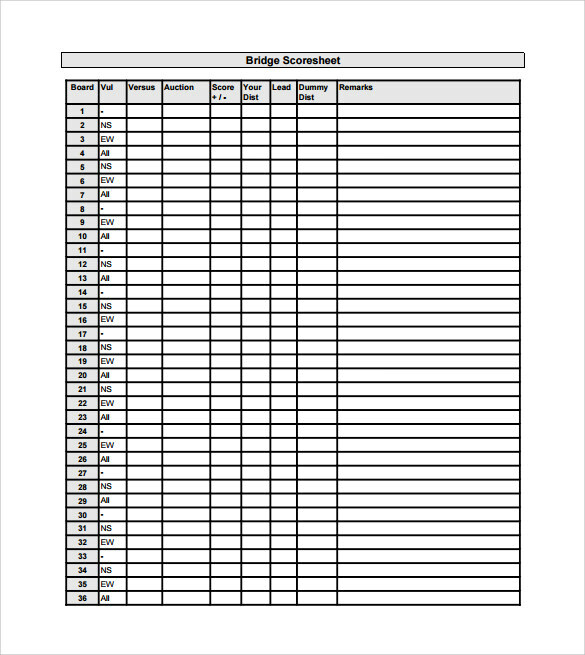 You can get sample bridge score sheet online which is available in different format. 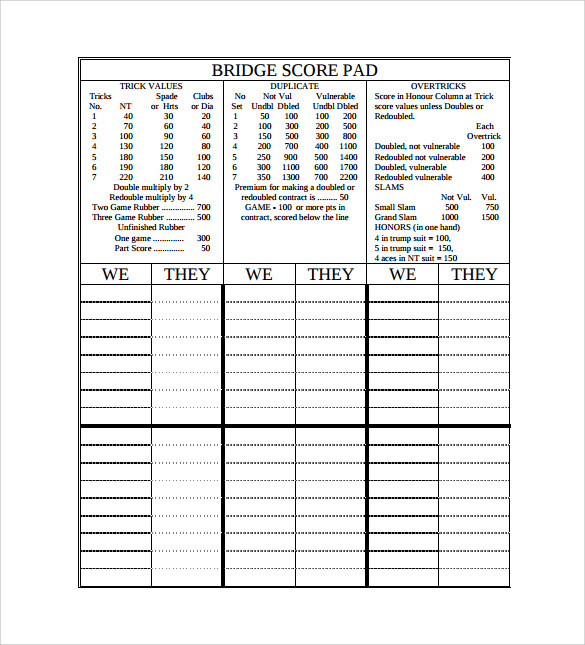 This sample of bridge scoring sheet has a simple scoring pattern. The names of the players are written on the first horizontal column while the 1st, 2nd and 3rd rubber are written in the corresponding rows. Below the name sheet there are 6 column, where the words “we” and “They” appear in alternative combination thrice. This sample of bugger bridge score sheet is relatively simple. The template consists of several checked boxes throughout the page. On the first row , the numbers 1-8 are written in ascending order from top to bottom followed by two 8NT signs and then the number are again repeated but on a descending order starting with 8 and ending at one. 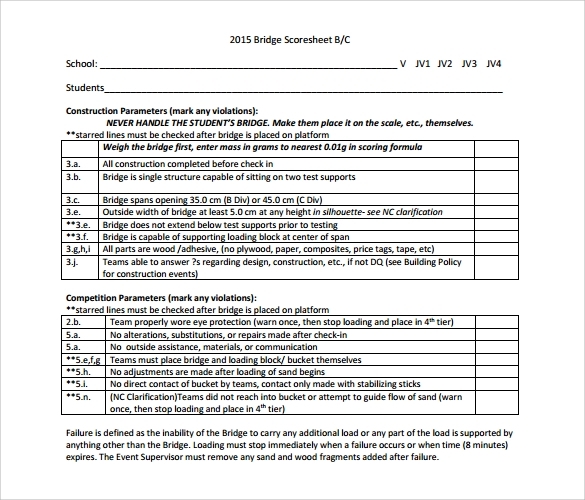 This is yet another sample of sample bridge score sheet in a checkbox format. The left most row consists of number starting with one. On the top most columns on the sheet individual columns are dedicated for noting down some important points like vul, versus, auction, score, lead, and dummy dist and rewards. 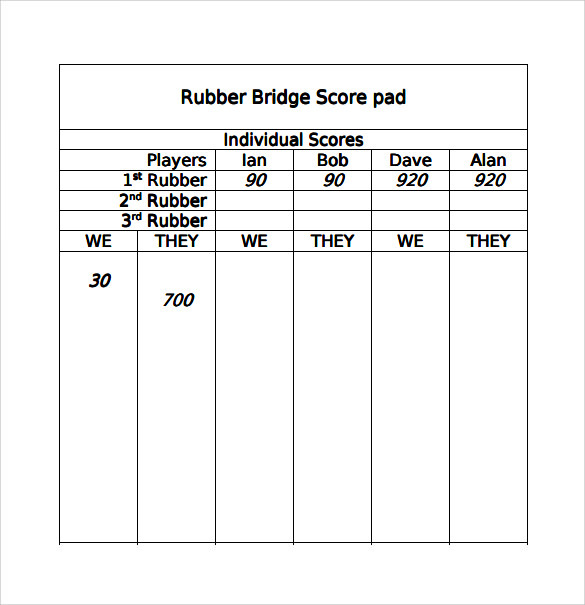 This sample of rubber bridge score sheet is one of the simplest forms of bridge score sheet. 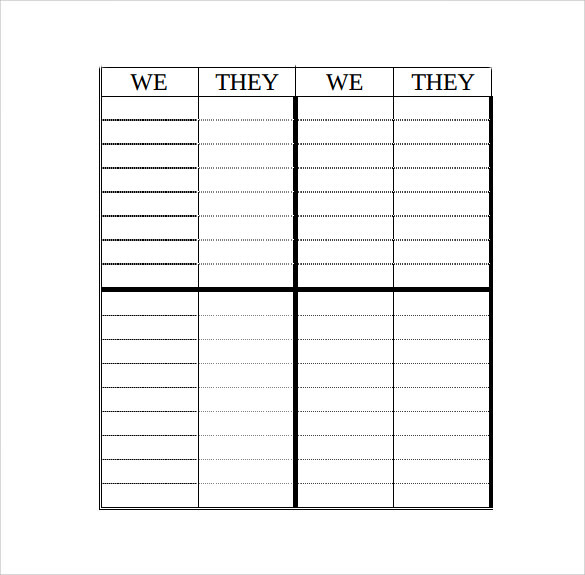 The words “we” and “they” appear in alternating columns for eight consecutive times. At the end of the sheet there is a small table made which writes down the individual score of players in the form of 1st rubber, 2nd rubber, and 3rd rubber and so on. How Scores Are Kept In A Bridge Game? There are many methods of scoring, however, the most popular method of scoring for a single table of bridge is called “Chicago” or four-deal Bridge. A typical round consists of four different deals, one each by every player in turn. If a deal happens to be passed out, it is not counted and the same player gets a chance to repeat the deals again. It is considered customary to draw a large “X” on the score sheet to indicate the exact deal number and who the dealer is. You may like Yahtzee Score Sheets. What Makes Bridge Such An Exciting Game? 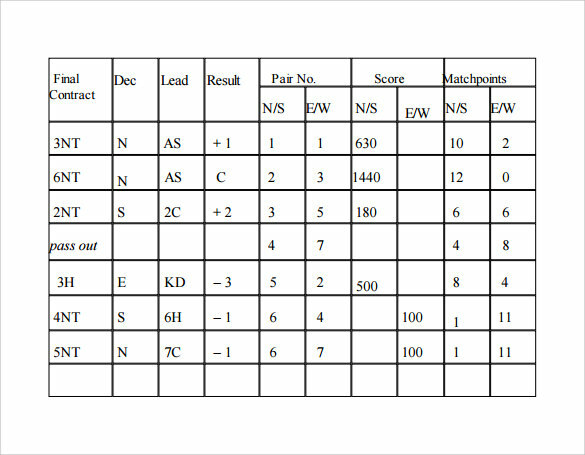 Vulnerability in the game of bridge adds spice to the game by changing and altering the magnitude of the scores that an individual player can obtain, either for making or defeating a contract. On deal 1 both the sides remain protected, however, on deals 2 and 3 the dealer side is considered a bit more vulnerable whereas on deal 4 both sides are vulnerable. 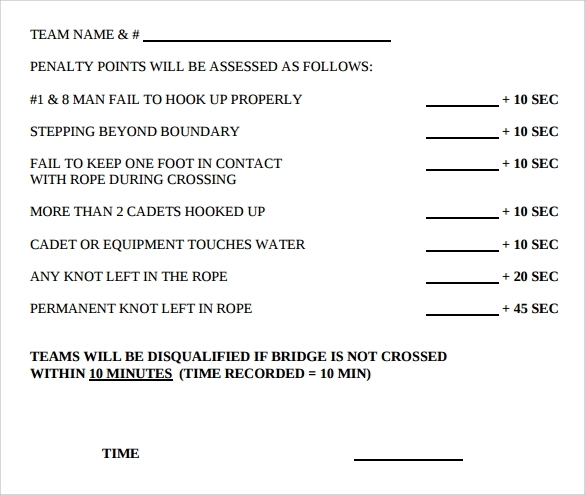 How Is Rubber Bridge Scored? A rubber bridge is also played among four players but the player who wins manages to play the best of three games. The game is won when the first team scores 100or more points over a series of successful deals. A player who has already won one game towards the current rubber is considered vulnerable. A side which has not done so is considered relatively safe. A vulnerable side is subjected to higher penalties and bonus than their opponents. You can also see Canasta Score Sheets. Bridge is a complicated yet very interesting and intriguing game. Scoring plays a big role as it determines who wins the game. 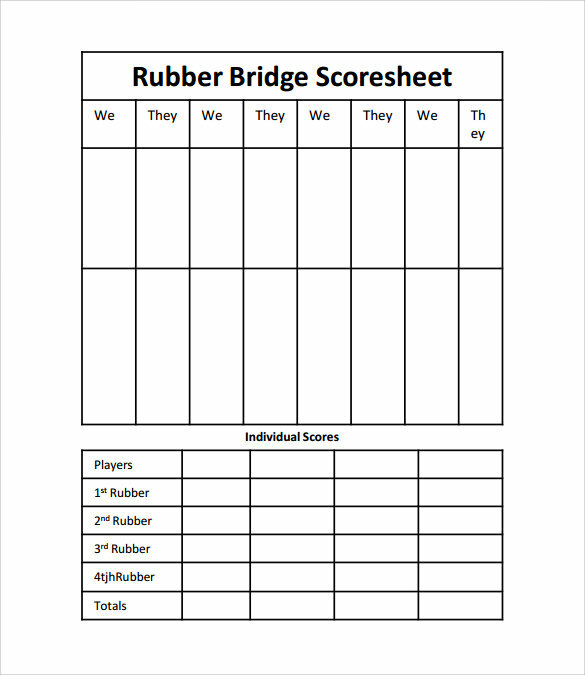 You can download one of our several bridge game score keeping sheets and easily keep a track of every move by every player and increase your chances of winning a deal .